Is there such a thing as an electric fence, but for sharks? Marine biologist Marcella Pomárico Uchôa stood at the edge of a small boat in the Bimini region in the Bahamas, watching a floating piece of white PVC pipe, rigged with wires and a bag of minced meat, bob up and down with the waves. It wasn’t long before the sharks arrived. The sharks weren’t shy about their interest in the minced meat. They charged toward it at full-speed, only to swerve away at the last moment. In contrast, the Bermuda chubs and bar jacks swam right up to the rig and grabbed a snack without hesitation. Something was changing the sharks’ behavior. 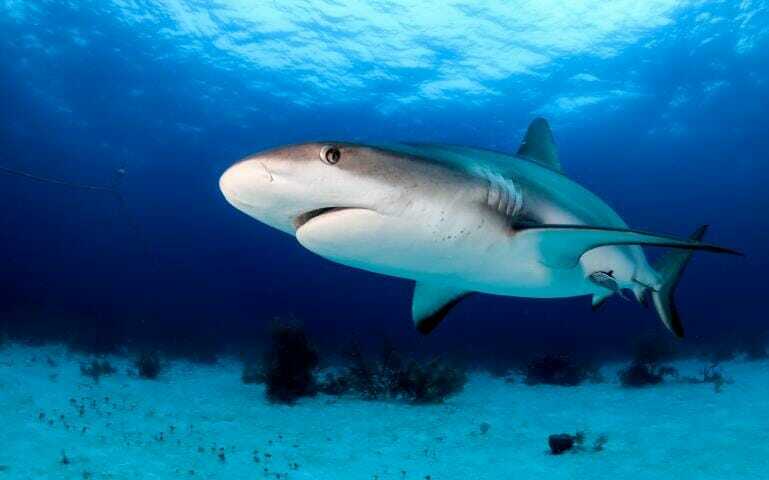 The two species Uchôa’s study focused on—bull sharks (Carcharhinus leucas) and Caribbean reef sharks (Carcharhinus perezi)—can sense electric fields in the water. Their electrosensory organs—called the ampullae of lorenzini—are sensitive enough to detect the electric activity in their prey’s nervous systems, allowing sharks to lunge at their prey blind. As Uchôa and her colleagues reported in the journal Animal Biology last year, the wire and PVC rig emitted a low voltage electric current that seemed to befuddle the two species of shark. Ordinary fish—without an electromagnetic sixth sense—didn’t seem to notice the electricity at all. As far as the observers on the boat could tell, the sharks weren’t hurt by the electric field. “Sharks just avoid them because it’s confusing,” explains the study’s co-author Thomas Goreau of the Global Coral Reef Alliance, an organization that restores coral reefs by building artificial electric reefs. This confusion could open up new markets for Goreau’s coral reef restoration business. Back in 1987, Goureau was writing coastal zone management plans for hotels and fisheries in Jamaica when he met an architect and inventor named Wolf Hilbertz. Hilbertz had been developing construction materials for underwater buildings when he found that electrically charged metal attracts dissolved minerals in seawater. Over time, these minerals build up, forming a material similar to concrete–or to the calcium carbonate of coral reefs. The two began designing synthetic electric reefs—which they called “Biorocks”—meant to slow coastal erosion and provide habitat for coral reef species in areas that had seen massive coral reef damage. About 400 were installed in over a dozen countries including off the coast of Panama, the Saya de Malha bank near the island nation of Seychelles, and Gili Trawangan in Indonesia. Most are close to shorelines and draw from the nearby islands’ power grids, but Goreau and his colleagues have been experimenting with using renewable power sources such as solar panels and wave power generation. In thirty years, Goreau had never seen a predatory shark hanging out near a Biorock reef. Then, while giving a talk at the University of the Basque Country in Spain, he met Uchôa, who was a marine science grad student at the time. The two began looking into whether Goreau’s experience could be backed up by real-world experiments, and whether Biorocks could function sort of like underwater electric fences, steering sharks away from popular diving areas. Shark bait experiment in progress. Photo courtesy of Marcella Pomárico Uchôa. 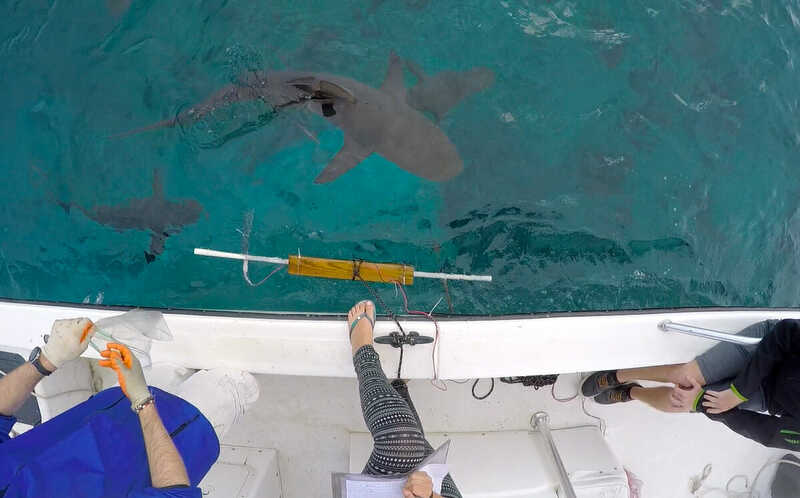 Shark deterrent field tests by academic marine biologists—who are independent of the deterrent-making companies—have found that those effects can vary quite a bit. Sometimes, the sharks seem to hesitate in the presence of an electric field but go in for the kill anyway. Sometimes, they don’t go for the bait but stay within a few meters of the boat. The effects differ between species, and a few people have even been bitten while wearing electromagnetic shark “deterrents”. Ideally, says says shark biologist Ryan Kempster of the University of Western Australia, the electrical field produced by a shark deterrent should be tailored specifically to the size and species of the shark in question, because every species detects and responds differently to electric fields of varying strengths and frequencies. If Biorocks work to keep sharks away from beaches that are popular with divers, such a scenario could be beneficial to sharks, since they are more likely to be hurt or killed by humans than the other way around. But Goreau freely admits that more research is needed. The PVC pipe rig in Uchôa’s experiment emitted an electric field very similar to that of a Biorock reef but not identical. In the majority of the experiments, sharks didn’t swerve from the PVC pipe rig until they were just a few feet away from the reef, which could mean that Biorock placement would have to be strategic to prevent sharks from swimming through areas that the field doesn’t reach to. Goreau admits that it’s possible that no one has seen large predatory sharks swimming around Biorock reefs simply because there are so few large sharks left worldwide. Rays and nurse sharks, which can also sense electricity, live on and near Biorocks and do not appear to be affected by the Biorocks’ electric fields. It is possible, though, that the electrical field could have some effect on the behavior of sharks, rays, and skates that is not readily apparent. That alone is reason to be cautious, according to Uchôa.